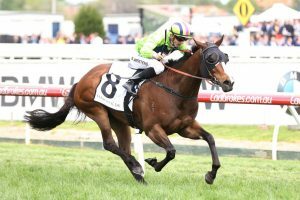 Henry Dwyer’s five-year old mare Snitty Kitty has firmed from $5.00 into the $4.00 second-elect with Ladbrokes ahead of this afternoon’s $400,000 Schillaci Stakes (1100m). Snitty Kitty, above, hopes for a strong run second-up today in the Schillaci Stakes. The mare out of Snitzel ran fourth in the Group 1 Moir Stakes (1000m) at The Valley a fortnight ago, and looked like he wanted a little more after running home strongly following a slight nudge from eventual winner Nature Strip down the straight. “Snitty Kitty is a great little mare and she is super quick out of the barriers,’’ part-owner John Messara told The Daily Telegraph on Friday. Snitty Kitty will jump barrier 2 at Caulfield, and owns an impressive 2-2 second-up record across 15 career starts. The path to Group level hasn’t come easy though, as Snitty Kitty was once an easy-beat galloper in fillies races last year into a serious Group 2 horse in 2018. It’s a move Dwyer credits to a gear change, one that had the stable feeling pretty confident ahead of the Moir. ”She is pretty dynamic at Caulfield, but you would think Moonee Valley, a tight-turning track would suit her being a front-runner” Dwyer told the Sydney Morning Herald last month. He’s right, Snitty Kitty has finished no worse than third in seven career starts at Caulfield, and with the blinkers on again, has a handy inside draw to challenge $3.10 race-favourite Voodoo Lad down the straight. Full Schillaci Stakes odds can be seen below.